The Short Version: B.I.G. 's bad, bland 'B' flick is a slight step up from his first gig in 1955 directing giant lizards attacking uninterested humans sharing the screen via bad matte jobs. At least here, there's a snarling, rabid Chaney Jr. to keep your eye on with his despicable performance that's more monstrous than the galley of giggle-worthy monstrosities trotted out in the film. The special effects (and they are certainly "special") are the usual melange of "ghost" critters that crop up in Gordon's flicks. Nonetheless they have a malignant charm about them that will make your eyes bug out and your jaw drop at their brazen crudity. And yet the eye has it as the make up job for the single orbed giant of the title surpasses all the tackily rendered, superimposed pituitary pestilence of the enlarged iguanas, spiders and birds. If you're a fan of Paul Frees, you may find enjoyment in that he contributes his vocal talents with assorted grunts, groans and animal noises as heard throughout the picture. Susan Winter charts a plane and hires a few guides to fly into forbidden territory in Central Mexico to find her missing fiancee who disappeared there three years earlier. After a forced landing leaves the quartet stranded in a remote valley, the group soon discover the land is filled with uranium deposits and giant creatures including an enormous, cyclopean humanoid. After learning continued exposure to the high levels of radiation permeating the surrounding lands may cause them to grow in size, the group must decide to continue the search or head back to civilization. Bert Gordon's follow up after the deplorable KING DINOSAUR (1955) is only slightly better, but operates in much the same fashion. That film was about a small group of astronauts stranded on another planet with assorted macro-enlarged lizards masquerading as dinosaurs. THE CYCLOPS has a small rescue expedition stranded in an isolated valley surrounded by macro-enlarged birds, lizards, arachnids and a giant one-eyed man. Both films are frequently dull, despite both lasting approximately 65 minutes each. THE CYCLOPS (1957) is the more enlivening of the two. The plot is standard 'B' fare, but a nicely compact adventure yarn with a lot of pulpy potential that is squandered on what is little more than a cheap nickle n' dime programmer. Unfortunately, the picture begins to encounter turbulence rather quickly -- just before Chaney causes the plane to nearly crash into a mountain in one of the films supremely soft-headed moments. Speaking of this scene, Melville (Chaney greasing it up in an avariciously inebriated performance) wants to land a bit too eagerly in the hopes of grabbing some uranium ore. So instead of waiting patiently, he decides to lay a right cross on the chin of the pilot! Now unconscious, Bradford (James Craig) begins struggling with him while Susan (Talbott) sits calmly in the back and only seems interested in resuscitating the pilot once the plane has nearly dove into a mountainside. Once they land, nobody seems to be upset, or even bring up the incident. Needless to say, this isn't the first time Melville puts people in peril, nor is the last time the characters show a total disregard for common sense. Jockeying for screen stupidity, the dialog contains a few valuable gem stones as well. One of them occurs when Susan disappears from the group. Surrounded by foliage of every sort, Lee somehow spots something out of the ordinary amidst the vast floral forest and spouts off, "Russ! A bent twig! I told you I was part Indian!" Lee reminds us an additional THREE TIMES of his Indian heritage in fairly rapid succession during the pictures last half. Another gloriously boobish moment occurs when our heroes become trapped inside that SciFi 'B' flick oasis, Bronson Caves. But instead of encountering Ro-Man from ROBOT MONSTER (1953), they find Susan and a bunch of airplane parts. The Cyclops suddenly shows up in a shock moment akin to those 'Boo' bits you always get in slasher pictures. A matted in rock has inexplicably appeared blocking the entrance. After a brief, threatening run-in by the one eyed giant -- who only wants to rub, pet, squeeze and call them George -- Melville shows his increasing antipathy for the situation by stealing Bradford's rifle. Of course, when they wake up, Bradford, nor anyone else, seems to notice their prime source of defense is missing. An ironic, even sad piece of dialog comes from Chaney during this cave sequence. He looks to Lee the pilot and says, "You got a drink? I need a drink!" Lon Chaney's bout with alcoholism was in full swing at this point, and according to interviews with actors on this film, he was most definitely sauced while shooting his scenes. Still, in Gloria Talbott's words to Tom Weaver, "[He was] drunk as a skunk... He was a bear of a man, but kind and sweet. I loved him." That brings us to the bounty of bad opticals littering Bronson Canyon in this movie. An out of whack pituitary gland due to radiation exposure causes various animals to continuously grow, thus giving Bert I. Gordon ample opportunity to play around with his pocket full of camera tricks. Sadly, relatively few, if any, make any sort of impression unless you count giggling as a positive response. One of the main problems that plagues Gordon's movies are the static approach in the way the effects are presented. Either the actors are at the left or right of the screen while a stationary creature sits there on the other side of them. There's no variance to the way the effects are photographed. These shots are made even worse by sloppy insertion with the live footage, and a preponderance of transparency on the superimposed creatures that makes them look like apparitions. At some points, you can see wires in the matte holding the critters in place. A big spider, who emits a high pitched squeal akin to the "HEEELP MEEEE!" yelp of 1958s THE FLY, is an example. This could be one of Paul Frees vocal attributes at work. The battle between two lizards as they roll and tumble while nipping at each other is a brief bit of hilarity as the two scaly combatants become partially invisible from one shot to the next (see insert pic). It's worth noting this footage isn't the same as that spectacularly gruesome sequence of lizards mocked up to look like dinosaurs that was recycled several times in other Science Fiction and exploitation movies like THE LOST WORLD (1960). For Gordon's movie, he could have simply made a small set out of a shoebox or something (kind of like what was done in THE GIANT GILA MONSTER from 1958) and had the real lizards flip around in it, but instead, he opts to superimpose the outsized animals within a real surrounding. In either case, the realism, or lack of it, would have remained the same. The death of Melville is a confusing piece of footage. Apparently he's crushed by the giant, but the way the scene plays out, he's simply reaching out to grab him as Melville swings wildly away. We never see him perish, it's just mentioned later that he's dead. The worst shot in the picture is possibly the lamest ever seen in Gordon's oeuvre (see insert pic). In the same scene as described above, the giant reaches out and grabs Susan (who, as we already know, is her husband she's been looking for). As he pulls her away the entire frame comes with him! With so many low grade effects shots generously peppered throughout, not everything is a total loss. The films best special effect would arguably be Gloria Talbott's twin missiles poking through her soaking wet shirt after emerging from a pond once the death struggle between the two "spectral" lizards is over (see above pic). Gloria Talbott starred in a few other genre pictures including DAUGHTER OF DR. JEKYLL (1957) and THE LEECH WOMAN (1960). Her best movie of the Science Fiction sort was the classic I MARRIED A MONSTER FROM OUTER SPACE (1958). A lethargically brief battle with a gigantic python is a highlight due mainly to the fact that the stuntman was reported to have been nearly squeezed to death by the snake once it wrapped itself around his neck and chest (see insert pic). If you didn't know, you probably wouldn't think much about spotting any moments where it looks like the actor is in trouble. Despite having about as much excitement as the Captain Kirk-Gorn fight from STAR TREK, the scene itself is a breath of fresh air since it's pulled off live in camera as opposed to mucking it up with slipshod composites. The effects aren't the only lackadaisical proponents here. Ira Morgan's inertia saturated cinematography fails to make any one scene stand out. There's no distinction between flesh tones and the "jungle" surroundings. Everything just runs together with many wide shots making animate objects almost camouflaged within the frame. This lifelessness of the camerawork does more damage to the picture making it even more drab than it already is. Albert Glasser's score fares no better. It's a collection of loud cues and stings cobbled together that fails to evoke a sense of danger. But then, when your monster scenes are languidly paced and photographed, no amount of catchy cues are going to stimulate ones interest. 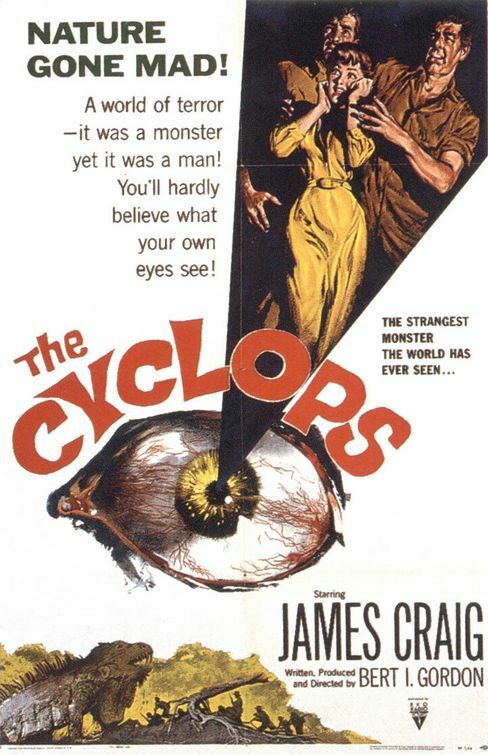 THE CYCLOPS (1957) recently hit DVD via Warner's MOD line in widescreen format. There have been two different versions floating around over the years -- one cut and the other uncut. Intitially WB released the cut print, but have since replaced it with the complete Allied Artists version that contains the rather bloody sight of the giant ripping out a makeshift flaming spear that was plunged into his one good eye! The version that ends with a title card stating "Distributed by RKO Radio Pictures" is the cut print; and the source of this review. Furthermore, it's unknown (at least to me) as to where RKO distributed this, or if they planned one prior to AA getting it, but some prints survived with their logo at the end. Furthermore, the old Thriller Video tape hosted by Elvira contains the missing footage as well. THE CY-WHOOPS! is a more accurate moniker for this picture with all its flubbed effects work, flaccid photography and stagnant dialog. Outside of Chaney's alcoholically enhanced portrayal and the make up of the Cyclops, there's virtually nothing here that brings the picture out of the mire of a standard, penny-pincher programmer. For a better representation of Bert Gordon's work, set your sight on THE AMAZING COLOSSAL MAN (1957) or even the fantasy flick, THE MAGIC SWORD (1962). As far as his cyclopean cinematic achievement goes, he apparently filmed this cheapie with only one eye open. This review is representative of a TCM airing.